GO QUIZ: Luxembourg; Who Knew? MEMBER'S EDITION BONUS CONTENT: Kazunari Furuyama - who's just confirmed he'll be at this year's U.S. Go Congress - takes a look at "The Importance of the Net Tesuji" in this week's installment of his Important, Fundamental Matters series in the E-Journal. Non-members: join the American Go Association and get all this great content with every EJ! It's all just a click away! U.S. WMSG UPDATES: Room on Women's Team: There's still room for as many as three more players on the World Mind Sports Games (WMSG) women's team, reports Chris Kirschner. "We currently have 7 players who have indicated an interest in participating," Kirschner tells the E-Journal, "We are looking for one more member, and an alternate or two in case some of those on our current list are unable to attend." If interested, email wmsg@usgo.org asap; first come, first served. Final WMSG Qualifier Points Reported: The final qualification points totals for the Men's competitions have now been totaled, reports Chris Kirschner. "Players with high point totals must contact us immediately, so that we can finalize the team," says Kirschner. Email wmsg@usgo.org or phone 206-579-8071. The team will be comprised of 13 male players plus one additional on the mixed pair team, which has been chosen separately. "Players who do not contact us by June 8 will be considered as declining to participate," been selected for the Pair Go team. Click here for additional info on U.S. WMSG participation. SEUNG HYUN HONG WINS OC OPEN: Seung Hyun Hong 8d swept the first annual Orange County Open, topping 36 players from both ends of California, including sixteen players in a strong open section competing for Ing Cup and Mindsports qualifying points. The event was held May 30-June 1 at the Chinese Cultural Center in Irvine, California. Seung Hyun Hong 8d took first place with a perfect 5-0 record and Dae Hyuk Ko 8d was second, losing only to Hong. Third place went to Wenhua Tang 6d, fourth to Yixian Zhou 7d, and fifth to Kuo-Ruey Han 6d. In the Handicap division, awards were as follows: Dan division: 1st: Masaya Tsukamoto 2d; 2nd: Huan-Min Chang 5d. Upper Kyu: 1st: Jerry Shen 4k; 2nd: Andrew Okun 2k. Lower Kyu: 1st: Scott Nichols 14k; 2nd: Larry Gross 17k. Kevin Chao directed the tournament. - reported by Steve Burrall; photo above: Seung Hyun Hong 8d receives the first-place trophy as Kevin Chao (l) looks on; photo by Andrew Okun. FOUR TOP BAY AREA TOURNEY: Four 3-game winners topped the May 24 Bay Area Go Players May ratings tournament in Palo Alto, California. Twenty six players attended the BAGPA May ratings tournament, including thirteen youth players, and Steve Burrall was the TD. Three-game winners: Natsuki Kamiya 5d, David Carlton 1k, Samuel Gross 6k and Vincent Huang 11k. Photo left: Patrick Wang 15k (r) squares off against Vincent Huang 11k; photo by Yanping Zhao. BRUCE FENG TOPS HAPPY CUP YOUTH GO TOURNEY: With five wins, Bruce Feng topped the Happy Cup Youth Go Tournament on May 31 in Santa Clara, California. 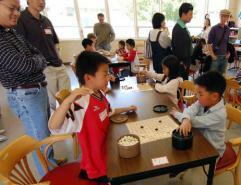 Nearly two dozen elementary school kids gathered to play 13x13 go in Santa Clara at the first Happy Cup tournament. Organizers Wenguang Wang and Yanping Zhao, made sure that every kid left happy, including the youngest player, who was 5. The five-round tournament was held at the Morningstar Chinese School. Each child received prize tickets after each round, which they exchanged for stuffed animals and other small items. A refreshing ice cream party at the end washed away any losses, and every participant received a trophy as well. Winners report: 5 wins: Bruce Feng; 4 wins: Patrick Wang, Austen Liao, David Viramontes. - Lawrence Ku, AGA west coast reporter; photo at right by Ming Liao. KGS SEMI-FINALS THIS WEEK: The semi-finals in the 2008 KGS Suk B Choi Amateur Invitational will be held this week. Chris Wong (HFL) will face Shaoyou Ouyang (oysy) on Thursday, June 5th at 7:30A EST (4:30A PST) and Andy Liu (bigbadwolf) will play DaeHyuk Ko (chunga) on Saturday, June 7th at 2P EST (11A PST). SOMERSET USYGC ONLINE: Tournament statistics and photographs from the May 24-25 United States Youth Go Championship in Somerset, New Jersey are now available on the Feng Yun Go School website, reports Paul Matthews. 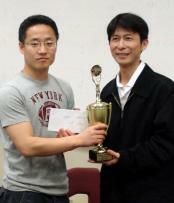 Photo left: USYGC Senior Division winner William Zhou 6d. BOARD NOMINATION DEADLINE LOOMS: The deadline for nominations for the AGA Board of Directors is June 15th. There are 4 seats open this year; all 3 regions will elect one seat and the at-large seat. Nominations must be made in writing by current AGA members. Send nominations to elections@usgo.org. Any member affiliated with an AGA Chapter may nominate any full AGA member to be a director to represent the region where the chapter is located. Any member may nominate any qualified person for the At-Large position. Make sure the nominees accept the nomination in writing and meet the requirements by June 15. Click here for details. THE MIDDLE PATH: Eighty six students at Southside Middle school in Shelton, Washington, spent part of the past academic year studying go. Math and Science teacher Cydne Bennington introduced go as part of a daily enrichment program for her students, who range from 10-13 years old. "Students learned the fundamentals of the game, participated in go tournaments, and are ending the year playing go on the KGS website," reports Jason Baghboudarian of the Olympia Go Club. 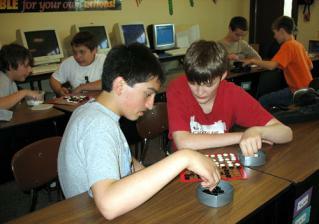 In addition to the daily class, the school go club drew up to 10 players weekly during the final few months of school. Bennington says she was inspired to launch her program by classes she took with the National Consortium for Teaching about Asia. Local go resources also proved quite helpful. In addition to Baghboudarian, and various members of the Olympia Go Club, AGA board member Dr. Gordon Castanza, and Evergreen College student Rob Taylor all helped out with the program. CORRECTION: David Byrne 2k (not Bin Li) won the B Division of the recent Boston Open. 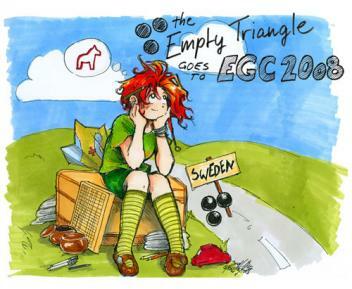 EURO CONGRESS TOPS 750: Over 750 people from 37 countries are now registered for this year's European Go Congress in Leksand, Sweden, which runs July 26 through August 9. "Many side events are developing nicely, like the Asian national theme Days," organizer Henric Bergsåker reports. "It also looks like we are going to have at least 20 Far East pros now." Also confirmed is Empty Triangle comic author Chidori, who "offers to make unique drawings on T-shirts or fans and we hope that this will result in many new hilarious drawings," adds Bergsaker. COVERING THE WAGC: "Thanks for the terrific coverage of the WAGC," writes Richard Dolen. "Specially enjoyed the game attachments and the links to AGA and Nihon Kiin game scores." GO PHOTO: North Carolina go organizer Peter Armenia reports on his recent go adventures in Japan in his blog. Armenia - who's touring Japan, Thailand, and Cambodia -- visited both the Nihon Ki-in and Kansai Ki-in, and stayed at the country home of Mr. Matsumoto, a frequent U.S. Go Congress attendee, and visited a go shop in Osaka. When I came up with last week's quiz question -- which WAGC entrant has made the most appearances -- I had no idea Laurent Heiser of Luxembourg would wind up leading the tournament through 5 rounds in his 12th trip to the WAGC (Interestingly, according to the official WAGC records, Heiser has been there 13 times but he told EJ Managing Editor Chris Garlock last weekend in Tokyo that he'd actually missed one year due to a last-minute emergency). Seven of you knew it was him and Steve Fawthrop grumbled "This is a silly quiz," complaining that I made it too easy by giving the website link. Well...2 of you still chose well-known Mathew MacFadyen (9 times), and one each chose Frank Janssen (5 times) and Ricardo Zazueta (8 times). Indeed, quiz vet Kim Salamony laboriously searched the old records, not realizing the number of entries was listed on the website. She still got it right, of course. For the record, Leon Matoh of Slovenia also made his 9th appearance. Congrats to Francisco Castelblanco this week's winner selected at random from those answering correctly. THIS WEEK'S QUIZ: Laurent Heiser finished 11th this year; what was his previous best? Was it 4th, 6th, 8th, or 10th? Click here for your answer. When "Cosmic Go" master Takemiya Masaki (left in photo at right) stopped by the Nihon Ki-in last Friday to check out the World Amateur Go Championship, he sat down for his first E-Journal interview. Takemiya was born in Tokyo in 1951 and was a disciples of the Minoru Kitani school, rising to fame began when he was just 15 years old, when he was already 5 dan. Earning the nickname "9 dan killer" when he won several games against top rated players, his "cosmic style" focused on large moyo in the center of the board. Known for his consistency in winning titles, the longest period in which he did not hold a title has only been 4 years, and as recently as 2005 he had an impressive run of 16 straight wins, which was stopped by Omori Yasushi in the qualifiers for the 3rd World Oza. Takemiya also won the biggest Japanese backgammon tournament, the 12th Saint of the Board title, by beating the former holder, Abe Akiko. "Recently I haven't been able to participate in any tournaments," Takemiya told E-Journal Managing Editor Chris Garlock, "though I'm still playing. Actually, lately I've been into dance - mostly modern - maybe a bit more than go, even. Of course I'm trying hard at go and will do my best." Asked what amateurs should do to get stronger, Takemiya said "It's very important to play what you feel. It's best not to think of the difficult parts of go or to worry about it too much. A lot of amateurs think too much about winning and losing - of course winning is fun for everyone - but more important than winning or losing is playing your own game, playing the moves that you feel are right. If you're too worried about winning and losing you can get too focused on what you think might be the right move and you often lose that way. If you can relax a little bit and have fun with it, very often you'll find you're playing the right moves naturally. This is true whether you're amateur or pro, Japanese or foreigner, for everybody." In response to a question about his thoughts on the current status of world go, Takemiya said that "There are many different styles wherever you go. Korean go, which of course is very strong right now, seems a little bit dry. There's not the sense of spirit or interestingness. It's almost computer-like. That said, Japan had a great run of dominance of the go world and the advent of strong players from Korea and China - along with the spread of go worldwide - is a wonderful thing." "I turned pro at 15," Takemiya added, "and at that time I thought a lot about go and developed my own style of play. I thought then - and I still think now - that it's a very natural style and honestly I haven't really changed my style. I still think it's a very good way to play, but it's not for the fainthearted. I know you're all worried about me, because I haven't been playing a lot recently, but don't worry, I'm going to bring it. I have to show everyone how great my style is." 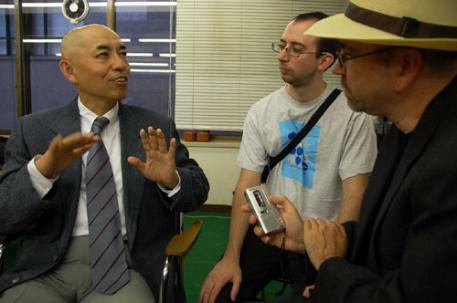 Sources for the background on Takemiya are Wikipedia and gobase.org; translation of the interview was provided by Jeremy Banzhaf and the photos are by John Pinkerton. Click here for an album of photos from EJ Managing Editor Chris Garlock's interview with Takemiya and of Takemiya doing a game analysis at the WAGC.